Thanks to individual donors, as well as donations from CIEE and a grant from Rotary International, we have updated our computer lab with all-new equipment. Most of the refugees in our community do not have computers at home and only have limited data plans on their phones. A fully functional computer lab provides a space where members of our community can follow the news online, practice their English, Skype with distant loved ones, and work on school assignments. The donations also allow us to restart our popular computer classes, with better and more reliable equipment. CRP is currently offering an Intro to Computers course and a course specializing in the Microsoft Word Suite. Hekmet, a long-time Iraqi volunteer, has been one of CRP’s strongest advocates for computer classes and has helped recruit and register students. Hekmet understands the importance of technology, especially as a means of communication; his wife and children were resettled without him to Canada in 2010, and he has only been able to see them one time since, when they saved enough money to visit him in Amman last year. He has a six-month daughter he has never met. He explains that the students in the computer classes “want to learn, want to develop themselves, to become better and better. They like learning new info. 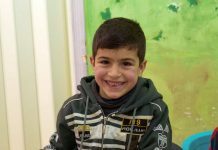 They can read newspapers online.” He knows firsthand that computers are an important way for separated families to stay connected too. Students listen to the teacher’s instructions during an Introductory to Computers class at CRP. Sawsan, one of the students, is new to computers. This week, she learned how to open and use computer folders. “It’s important,” she says, explaining why she joined the class. Zenah, who sits next to Sawsan in class, agrees. “It’s stressful, not knowing how to use computers. Everything involves them,” she says. We have highlighted before the uncertainties inherent in being a refugee. The individuals in our community do not know if, when, or where they will be resettled, or whether it will ever be safe for them to return to their countries. Though it is hard to plan for so uncertain a future, the individuals at CRP work every day to develop skills and improve themselves in order to be better prepared for whatever comes next. We are very proud that we are now able to help them increase their computer skills.